(1) THUMB ON THE SCALES. The Fourth of July was the day Vicksburg fell and the day after the South lost the Battle of Gettysburg. On our timeline, anyway. The war had a different outcome at Dinosaur Kingdom II — a theme park in Virginia where dinosaurs and an assortment of other creatures helped the Confederates defeat the Union. Or so goes the pitch from Vice News: “Inside the weird dinosaur park where Confederates defeat the Union army”). The owner claims not to be quite the Confederate apologist you might suppose: “That war had to have happened, because the fact that you and I can own somebody is just totally outrageous… and so that had to change.” And after watching a video tour of the park I was left wondering if Vice is selling the dino Lost Cause angle a lot harder than the attraction’s owner…. (2) BRAND NEW. Jeff VanderMeer has allowed the Last Exit To Nowhere company to make Southern Reach T-shirts. He told them that they needed to donate a portion of the profits to St. Mark’s Wildlife Refuge and notes that the zip code on the shirt is the zip code for the refuge. An official T-shirt approved by the author, Jeff VanderMeer. The inspiration for the novel was a 14-mile hike through St. Marks National Wildlife Refuge in northwestern Florida. Many of the animals and vegetation that VanderMeer has seen on this hike over the past 17 years appear in the novel. A proportion of the profits for this T-shirt goes to Friends of St. Marks Wildlife Refuge. 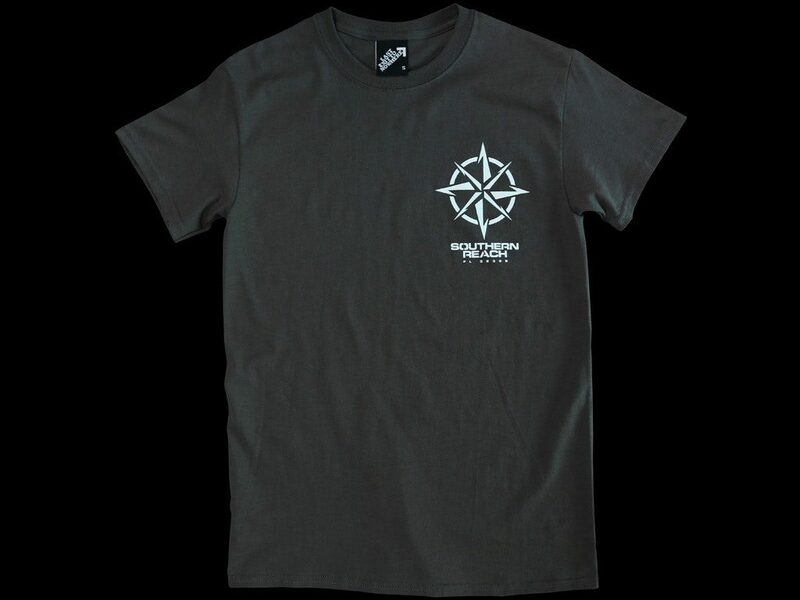 A single colour design, using a glow-in-the-dark ink hand screen printed on a regular fit 100% cotton military olive T-shirt. My Dad is home from rehab and doing very well. His speech, which was the main thing impacted, is improving every day. He’s continuing to get therapy at home. He said he’s fine with letting others know about the stroke. I had gone to Rockville just over a week ago to do some preparatory work for a convention – Corflu 36 – and naturally had tried to call Bob to arrange a visit with my fellow First Fandom member and pulpfan. It was quite alarming when my several phone calls over multiple days failed to be answered, something which had never happened before when calling Bob. I left messages and while driving home to Abingdon the next day I received a phone call from Stephen Haffner who told me about Bob’s stroke and that he was still in the hospital. Subsequent emails with Jane filled in the picture and I learned that Bob was headed for rehab the following week, which has now been successfully completed. Bob is, at this hour, back at home, no doubt watching a baseball game on tv. Stephen and I lacked permission from Bob or his family to share this news until now, probably for concerns of Bob being overtaxed with phone calls and so forth, but Jane now tells me that he’s improving steadily, to my great relief. Keep up the good progress, Bob! I’ll come to see you next time I’m in town to share a beer, watch a ball game with you, and maybe even buy a pulp magazine or two! (4) A REAL THREE-BODY PROBLEM. In an article on Gizmodo (“Einstein’s Theory of Gravity Holds Up on Test of a Three-Star System”), Ryan F. Mandelbaum examines a new paper in Nature (“Universality of free fall from the orbital motion of a pulsar in a stellar triple system”) and makes some comparisons on the side to Liu Cixin’s The Three-Body Problem. The Nature paper describes a test of general relativity using a 3-body system (PSR J0337+1715, about 4200 light years from Earth) which consists of a millisecond pulsar (neutron star) and a white dwarf co-orbiting each other very closely and another white dwarf less than 1 AU distant. They used 800 observations of the system spanning over six years, using the Westerbork Synthesis Radio Telescope in the Netherlands, the Robert C. Byrd Green Bank Telescope in West Virginia, and the William E. Gordon telescope at the Arecibo Observatory in Puerto Rico…. The researchers [Ingrid Stairs and Anne Archibald] could measure this behavior based on the pulsing behavior of the spinning neutron star. The observations revealed that the white dwarf and the pulsar seemed to behave exactly the same way in response to the other white dwarf’s gravity. General relativity wins again…. (5) A PERSISTENT VISITOR. JJ says be sure you read the thread down to the poem. The thread starts here. (6) AI SPREADS HOAX DEATH REPORT. While io9 headlines “Siri Erroneously Told People That Stan Lee Was Dead” as a Siri/Apple story (and it certainly is that), the underlying story is that a troll changed a Wikidata.org page to falsely say Stan Lee was dead. (Wikidata is a sister project to the better-known Wikipedia, which latter is reportedly one of the sources used by Alexa ) Siri (and a number of other digital assistants) pull info from various sources — some of which can be edited by the public — when asked questions. In this case, Siri would be in error on Stan Lee until another Wikidata editor reverted the change less than an hour later. That window, though, was clearly enough to cause some alarm. In a post on CinemaBlend, writer Sean O’Connell described a moment where he and his teenage son were driving home from an Ant-Man and the Wasp screening on Wednesday, to have his son ask Apple’s digital assistant Siri how old Stan Lee was. The response? “Stan Lee died on July 2, 2018.” They were concerned and checked the internet for news, but there was none… because it wasn’t true. But we were curious why Siri would share this specific information. The troublesome user (“&beer&love”) who started the bad data cascade had been kicked off Wikidata before and reportedly has now been kicked off again. Sadly, as long as there are trolls and as long as we collectively depend on data sources that can be corrupted by them, there will be such problems. (7) MULLER OBIT. Robert Muller (1940-2018): Dutch cinematographer, died July 3, aged 78. Worked on Repo Man (1984) and Until the End of the World (1991). (8) TODAY’S BIRTHDAY PLANET. Put another million candles on its birthday cake. “Scientists Capture First Birth Of A Planet” reports NPR. An international team of scientists has discovered a young planet — just 5 or 6 million years old — forging its own path through space and likely growing along the way. The scientists captured a photograph, which they say is the very first direct image of the birth of a planet still forming around a star. It’s a major finding for those of us on Earth, a 4.5-billion-year-old planet. The newly discovered planet may be young, but it’s huge: many times the size of Jupiter, which could fit 1,300 planet Earths inside. Researchers have long been on the hunt for a baby planet, and this is the first confirmed discovery of its kind. Young dwarf star PDS 70 is less than 10 million years old, and its planetary companion is thought to be between five and six million years old. Chip Hitchcock learned from Bizarro that tech shall not release you. (10) BOVINES WHO NEED BEANO. BBC science news — “Surf And Turf: To Reduce Gas Emissions From Cows, Scientists Look To The Ocean”. There’s much less methane being released than CO2 — but pound-for-pound it has a much worse effect on greenhousing. Livestock is a major source of greenhouse gases worldwide. About quarter of the methane emissions due to human activity in the U.S. can be chalked up to gas released from these animals, according to the U.S. Environmental Protection Agency. (11) HARD TO BE HUMBLE WHEN YOU’RE REALLY A GENIUS. Chuck Tingle proves love again. (12) FUN WITH BUGS. Camestros Felapton tries but is unable to restrain his enthusiasm in “Review: Ant-man & The Wasp”. I think it is fair to say that Ant-man & The Wasp is the most inconsequential Marvel movie for some time. No new superheroes are introduced, no new approaches to the genre are taken, there is little impact on the other MCU films, there are no big or deep themes to discuss. It is the first MCU film to have the name of a female Avenger in the title but that’s about it. But it is a fun, often silly film…. (13) FLASH AND THEY’RE GONE. People who love LibertyCon really love it. Rev. Bob brings word that the con sold out its 2019 memberships today, the first day they were available online. To be more precise, they opened online registration today and sold all 750 memberships in just under six hours. (“5 hours, 52 minutes, and 50 seconds!” per one source.) This is according to multiple Facebook posts by associated individuals, as well as the official convention Facebook page. It is worth noting that, according to those same sources, no 2019 memberships were sold at the convention itself. In addition, hotel room reservations have not yet opened; that won’t happen until sometime in September. (14) ALREADY SPOILED. Remember that spoiler-filled Batman news item I warned you about so strenuously in the July 1 Scroll? Well, genre news sites have splattered the spoiler everywhere and the comic issues in question have hit the stands. It’s up to you – skip the next paragraph if you want to preserve the surprise. Two articles published today (SYFY Wire: “Batman and the X-Men wedding dramas are the latest in comics’ matrimonial insanity” and Comicbook.com: “‘Batman’ Writer Tom King Reveals What’s Next After the Wedding”) take separate looks at love and marriage in comic books. Wenz casually reels off nearly a dozen different ways that marriages have failed to happen or fallen apart in just the first few paragraphs of his article. The most recent Marvel and DC will-they/won’t-they/oh-Great-Gnu-what-just-happened stories are examined in how they fit into these patterns. We’re halfway through that journey. It’s a long story, a long journey. It could have a happy ending or a sad ending. You’re halfway through the movie now. You’re in the middle of Empire Strikes Back and Vader just showed up and took Han’s gun. (15) A BUTTLOAD OF CATS. Martin Morse Wooster would hate for anyone to miss Rachel Bloom’s musical salute to SJW credentials, performed on Crazy Ex-Girlfriend. This is the cleaned-up version, although to my ear “buttload” fits the meter better than “fuckton” anyway.